Day 286 – Remember Your First Kenwood? Yep. . .it was back in 1976. We were so COOL, we could hardly stand ourselves! Music–that was what WE were all about! Well, not really, but it sounds really good! Actually, both of us remember people from our schools who were really–we mean, really–into music and so when you talk about playing that music–well, if you don’t have the right equipment, don’t expect to hear the sounds!! Uh, yeah. This is a problem for those of us who really didn’t CARE about what amplifier we had. . .we didn’t CARE about the quality of our speakers and we could care less about whether or not the bass and treble worked together! Nope. We didn’t care. Only the folks who were so incredibly into music cared and their numbers were impressive, and we should have paid attention to them. They had a way about them. They had a passion for music and they had equipment that could make the music come alive. Many of them had Kenwood receivers. Kenwood Corporation was one of Japan’s largest and most successful consumer-oriented electronics companies. Incorporated as Kasuga Radio Company in 1946, a young group of entrepreneurs had decided to take advantage of the growing market for postwar consumer products. Since much of Japan had been destroyed by the effects of World War II, the nation was eager and ready to re-create its national economy. One of the worldwide burgeoning markets included electronic equipment, so the Kasuga Radio Company was established in Nagano, Japan, to manufacture sophisticated high-fidelity electronic components and amateur radio equipment. Within a short time, the company was one of the leading electronic consumer products companies in the nation, and in 1949 Kasuga Radio Company made a major leap in technology-intensive manufacturing when it introduced the very first high-frequency transformer. Kenwood. . .if you grew up in the 70’s–you know. There was an intense competition between Kenwood, Marantz and Girard. . .depending on who you listened to and what you listened with. . .well, you were either cool or a LOSER! Thank goodness, we’re into wine and not into music- -amplified by companies that don’t have impact any longer! 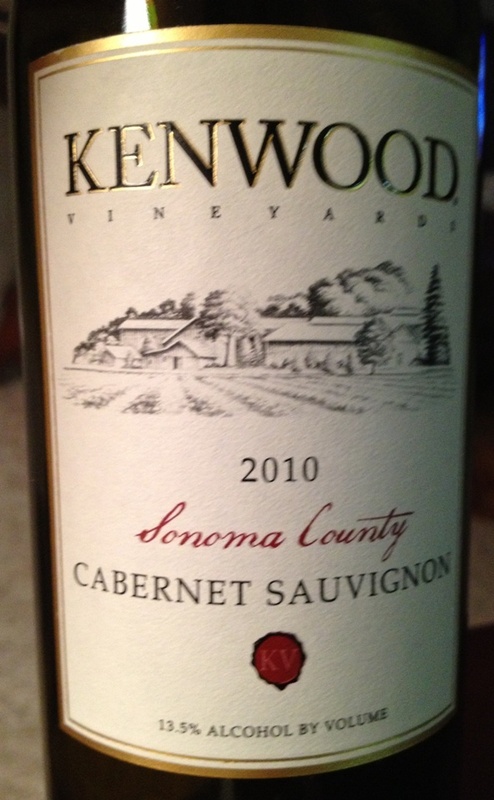 And, tonight we opened a 2010 Kenwood Cabernet Sauvignon. Yep, we went for a high volume cab tonight, but we were pleasantly surprised. Who would have thought we’d pick out a mass-produced wine that garnered 87 points and is considered a true wine to enjoy? Translucent dark ruby color, lightened a bit at the rim. Aromas of dark berry and currant fruit emote from the glass, along with shavings of cedar/menthol, light chocolate, vanilla, and note of herbs, and a kiss of cherry liqueur. It is medium-full in the mouth, where sweet, earthy, chocolate tannins show a youthful, furry edge. This red is structured to be enjoyed over the next few years. It delivers solid drinking pleasure at an everyday price. Serve with sliced roast beef in au jus. . .or in our case some sauted veggies and chicken in a garlic and olive oil sauce with a hint of spice from chili pepper flakes and a seasoning of “Slap Yo Mama”!! OH BABY!! For less than $15 a bottle, this wine will catch you off guard. The oakiness and the dark fruit are amazing – if you enjoy those components – and when combined with some spicy food the wine really stands out! We were both impressed and surprised by this wine–a wine that really deserves to be tried again. We’re all about trying things again…music, like wine, gets better with age. Sounds that were in vogue when we were in high school are now classics and songs that were on the charts before we were in high school are—well—legends! Whether you have a Kenwood receiver or a Pioneer–or whatever your favorite receiver/amplifier is, we hope that you’ll enjoy your favorite tunes as loud as you like while you enjoy your favorite wine. . .just remember to recycle whenever possible and enjoy responsibly! Categories: Uncategorized | Tags: 'Slap Yo Mama' seasoning, 1970's, Girard, Hi-Fi Radio, Kasuga Radio, Kenwood Stereos, Marantz | Permalink.